After many workshops and hearings with the users of Vesterbro Ungdomsgård, they are able to see the physical outcome of the engagement. They now have a new outdoor kitchen, a bench and a bonfire lounge – shaped and inspired by the wishes of the users. We started working with Vesterbro Ungdomsgård last Spring, where we facilitated workshops about architecture and urban design. After the workshops, we built movable wooden boxes that they could experiment and play around with. The members and staff could arrange the boxes in different compositions to shape a lounge area, a football pitch, a mini skate park and much more – co-creation in its purest form. After monitoring the usage pattern of the boxes, we moved on to the next phase of the project where we conducted several workshops with the staff and members to come up with a design proposal to makeover the garden. The outcome of these workshops was a program for the garden that was forwarded to the municipality. 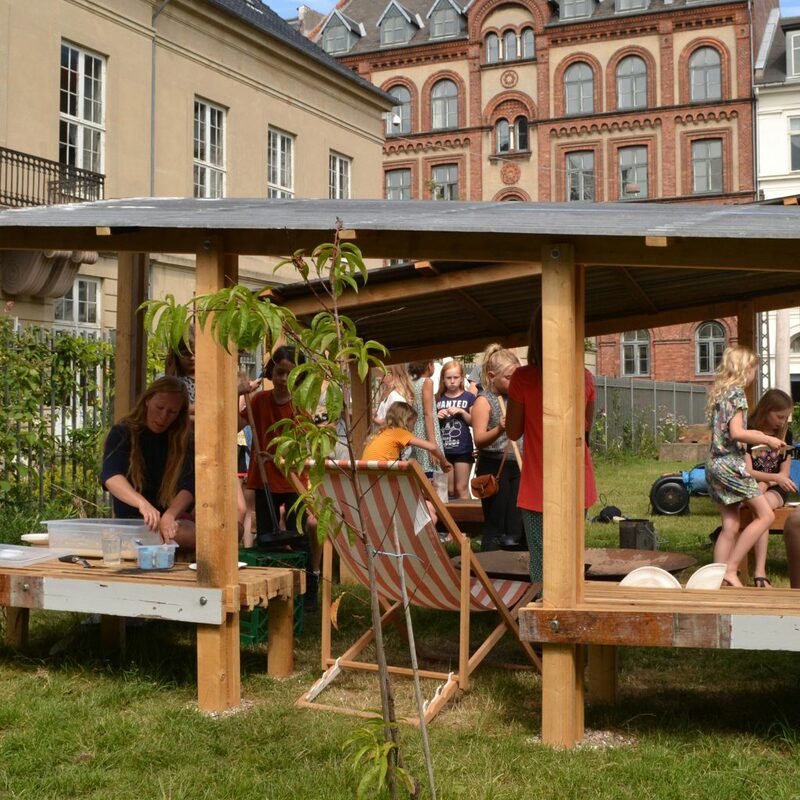 This program – fingers crossed – will be adopted this October and will hopefully give Vesterbro Ungdomsgård’s garden a whole new gorgeous look. Parallel to preparing this program, we had several workshops with the staff and the members to design some outdoor furniture for the garden. We took the outcome of the design workshops with us to the “goldmine”, who would help with building the three elements. 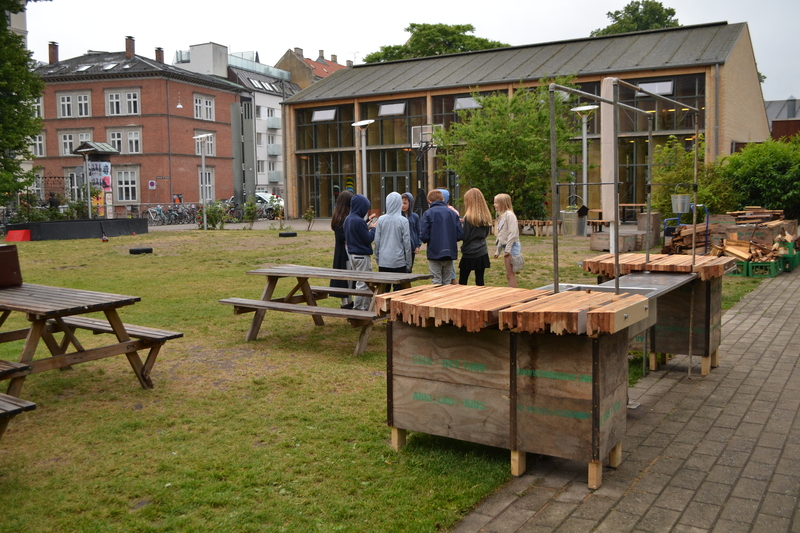 The goldmine is a municipality-funded project in a recycled center in Sydhavn, where small companies experiment, rethink, renew and upcycle the use of recycled materials. We collaborated with two companies stationed at the Goldmine, Repos and Studio Debris, to finalize the design and proceed to building. Building the furniture in the garden started a month ago and good news: Now it is done and up! The new furniture is now waiting to be pimped out with some nice edible plants and lighting. That final touch however has to wait until the beginning of August when the members are back from summer vacation, so they can be part of planting the new plants and deciding how to incorporate them into the furniture. A big thanks to Repos and Studio Debris, who were in charge of the building process – it has been inspiring to collaborate and discover the many design possibilities when dealing with recycled materials! 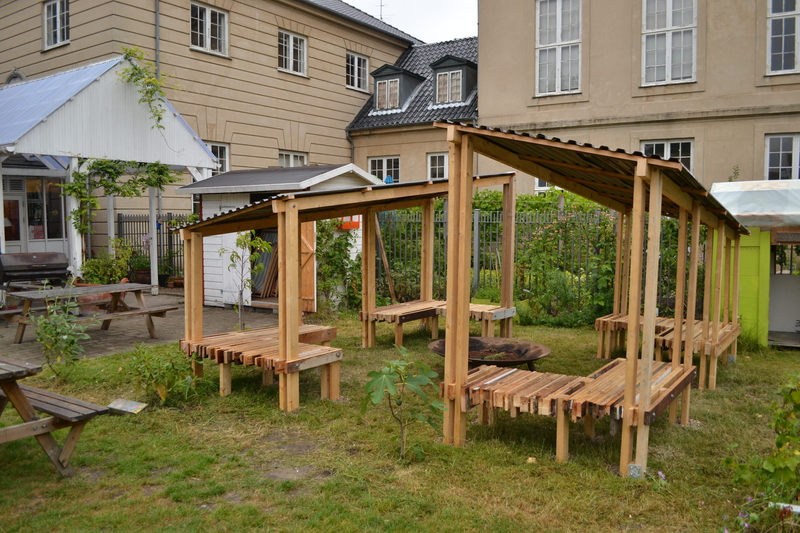 The process of transforming Vesterbro Ungdomsgård’s garden has been a long one that started in 2014… And it is not over yet. This garden will hopefully only look better as time goes by. Now we have to wait for the municipality to allocate a budget to the next phase of the project AKA the total makeover of the garden, but hey, good things come to those who wait!